Charlize Theron looks gorgeous in this updo for short hair. Get this simple prom hairstyle by curling your hair and directing it backwards. Start by running volumizing mousse through damp hair and blow dry all your hair away from your face. After it’s dried and curled, tousle the waves and tie a coordinating ribbon around your head to match your dress! Finger waves have been a glamorous hairstyle for decades since they caught on in the 1920's. They are much easier to do on short hair so they make a great choice for the prom if you don't have long hair. Use a setting lotion on damp hair and style these waves with a comb. Allow to air dry and you're good to go! 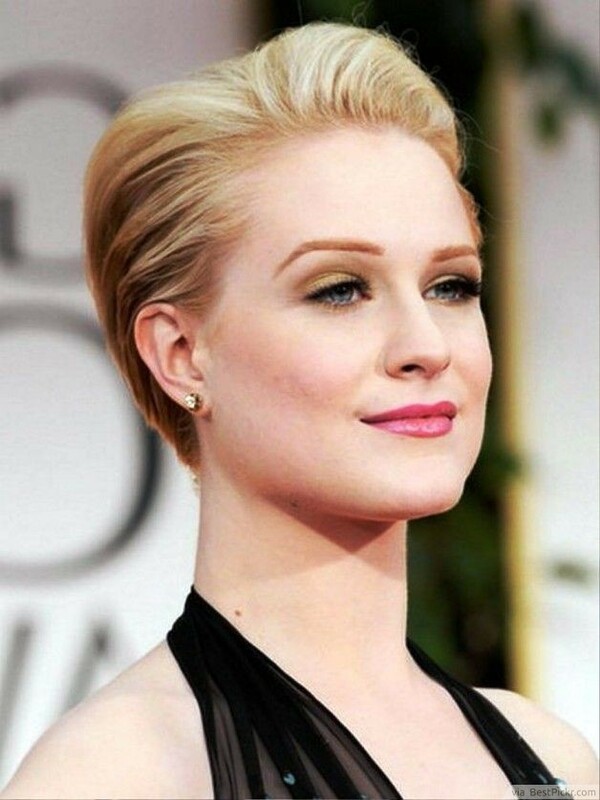 This is a classy, short bob haircut that is beautifully styled for prom. The thick side swept bangs are so flattering for every facial shape because they soften strong features. Use an anti-frizz serum to keep the curls shiny and smooth. Top it all off with a light spritz of finishing spray for all night hold! A tousled Mohawk is the perfect prom hairstyle for a rocker chick with short hair. Rebel against the perfectly coifed curls and updo's and be the real you! Run mousse through damp hair and then style with a molding paste for texture. Pair with a punk-inspired dress and slick on some red lipstick and you're set for the spotlight. A bob is such a versatile hairstyle for girls with short hair and that gives it a multitude of style options for prom! Try a messy look like this for that I-just-rolled-out-of-bed carefree style. Use molding hair wax to add texture and hold tousled tresses in place. This is a sleek prom hairstyle for girls with short, cropped hair. Tease the hair at the roots on top for volume and added visual interest. Then, comb the hair smooth against the sides of the head for a modern and trendy look. For short hair that's longer than chin length, this is a excellent hairstyle choice for prom! Making sure the curls fall below the chin keeps the hairstyle flattering for most facial shapes. The center part keeps the weight even on each side and makes for a lovely symmetrical style. Spritz on a finishing spray to keep curls shiny and not frizzy. If you have short hair and want an edgy look for prom, try having your hair cut with a razor. It creates jagged, pointed edges and loads of texture to play with. This hairstyle brings an element of rock and roll but can still be glammed up by your makeup and dress choices. Just add some hair wax and tousle away.